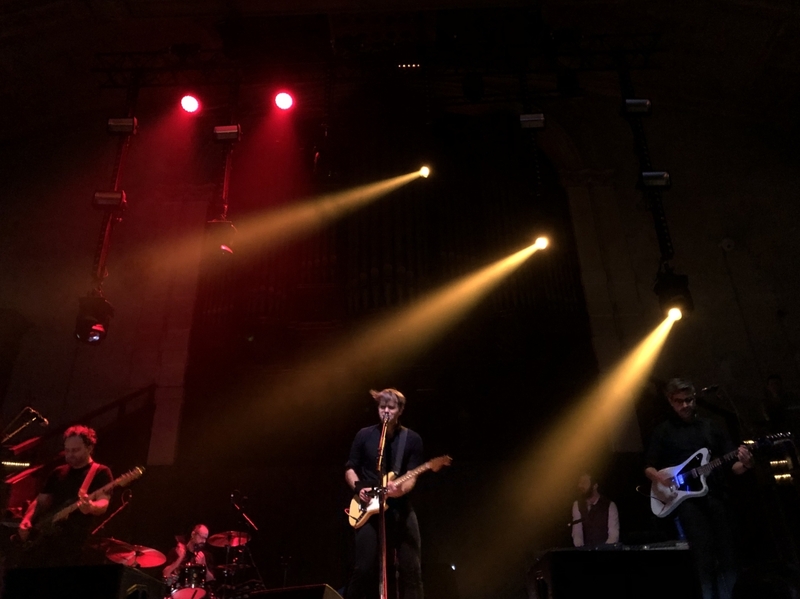 Death Cab for Cutie played a sell out gig to the faithful and Getintothis’ Abby Meysenburg got to fulfil a long standing ambition. In the early 2000s, there were a few guys in Seattle, Washington writing and releasing carefully crafted indie-rock under the moniker Death Cab for Cutie. At that time, this writer was in primary school just 34 miles away, but wouldn’t be put on to the band’s music until much later, after they had signed to a major label and were playing in arenas. As we eventually grew to love their early albums, we feared we’d never hear those songs live, let alone in a venue where the musician’s facial expressions could be made out. This past Friday night we had the treat of standing 10 feet away from the stage of a sold-out Albert Hall and singing along to many of the songs that accompanied our teenage years. The evening was warmed up by The Beths, a four-piece indie-pop band from Auckland, New Zealand. The UK/EU tour had commenced in Dublin the previous night, and lead singer Elizabeth Stokes told the audience that being in England, back under the rule of Queen Elizabeth, had her feeling more at home. The band’s four-part harmonies and summery guitar riffs perfectly set the mood for the rest of the evening. The lighting design was thoughtfully arranged and highlighted the organ pipes, archways, and stained-glass windows that make Albert Hall such an exquisite venue. Each instrument was clearly distinguishable in the mix and the stage crew effortlessly executed the well rehearsed guitar switchovers that seemed to happen in between every song. While the majority of the crowd bobbed along to the more recent tracks, cheers and a chorus of voices erupted when the first chords rang out of old favourites such as Title and Registration, Crooked Teeth, and A Movie Script Ending. Although the band has undergone a handful of personnel changes since their start in 1997 (including the addition of guitarist Dave Depper and pianist Zac Rae after the 2014 departure of original member Chris Walla), it is evident in all aspects of their performance that they have been at this music thing for a while. They moved freely around the stage while never missing a note, and seamless transitions left few gaps to be filled with awkward small talk. After high energy performances of Soul Meets Body (in which bassist Nicholas Harmer and Depper switched roles mid-song) and Marching Bands of Manhattan, the band bid the crowd goodnight and fled backstage. After a few minutes of heavy applause, Gibbard reemerged carrying an acoustic guitar and launched into the Death Cab’s biggest hit, I Will Follow You Into The Dark. The rest of the band joined him for two more songs before the final number, and emotional peak of the night, Transatlanticism. Gibbard, along with the 1,900 people packed into Albert Hall, sang out the simple line “I need you so much closer” over and over again as the dynamics built and more and more eyes welled with tears. Death Cab for Cutie and Manchester seem to have a mutual love, as the gig sold out five months in advance, and the band claimed the city as one of their favourite places to play. They’ll need to find a larger gathering space next time, but hopefully it won’t be too long until The Church of Death Cab holds another service.